Business travel, like most things, is best when kept simple. Often, the challenge for TMCs is untangling the increasingly complex itineraries that result from modern business travellers having a far greater choice of trip elements than ever before. After factoring in the sharing-economy market, a widening range of ancillary products and a lack of innovation to travel management tools, booking a business trip on behalf of your clients can be absurdly complicated. It's generally understood that, like any kind of consumer, your travellers don’t want to scroll through a plethora of products they aren’t interested in. You can ensure your clients are only suggested products that fit their needs by building traveller profiles and using them to filter the results of booking inquiries. Most TMCs will already be using simple traveller profiles to keep track of essential information, for example visa statuses, expenses limits and travel document expiration dates, but it’s also vital to track health risks, like dietary or accessibility needs. By digging deeper into their systems, TMCs will likely discover a treasure trove of traveller information buried there. Collecting this data empowers you to develop detailed profiles that include the small details that make a big difference to the business travel experience. This is a great opportunity to put PNR management tools to good use and save yourself time by automatically cross-checking flight, hotel and ancillary products against your travellers’ unique requirements. Extra choice means it's more likely that trip elements will be booked via disparate sources and providers – making the itinerary more complex. This often means that travellers need to juggle several apps, emails and texts at once, just to keep track of all the information. For TMCs, simply delivering this information a single, easy to access itinerary guarantees a much smoother business travel experience and a relatively easy way to impress your clients. Considering the increased travel risk of the 21st century, you should also extend this practice to safety briefings. All your business travellers should be receiving up-to-the-minute risk assessments that are tailored specifically to them and their trip – again, all in one document and sent directly to their preferred device. As travel managers, we need to accept there are things out of our control and, despite our best efforts, we can’t prevent all disruption to business trips. What we can do is reduce the effect it has on our clients. From delayed flights and overbooked hotels to acts of gods and human error, there’s a wide scope for misfortune during business travel. And for every additional trip element on an itinerary, the greater the possibility of something going wrong. It’s vital you’re able to communicate unexpected changes to travel arrangements – wherever your client is and whatever time zone they’re in. Mobile apps are an ideal solution because they automatically send an alert and update the traveller's itinerary when you make changes in your system. You can even create automatic alerts that update your travellers to any delays, cancellations, traffic or security alerts without you having to lift a finger. Just like you need to be able to communicate with travellers at all times, they also need the ability to contact you. Thankfully, AI-chatbots are making it possible to provide 24-hour customer support without you needing to lose any beauty sleep. What’s most astounding about the new wave of AI-chatbots is how natural they are to interact with, with one great example being Expedia’s bot. All users need to do is type in a few details about their travel plans and they’ll receive suggestions for popular hotels in a location. When an option is selected, users are redirected to an Expedia page where they can book a room, and, once the booking is complete, users receive confirmation and a link to their itinerary. Even the most technophobic travel managers can easily and affordably integrate chatbots with their website or app – you can even link them to directly to customer-service channels like Facebook Messenger or WhatsApp. As well as providing seamless customer care around the clock, solving traveller queries and helping with bookings, these AIs are also experts at collecting and analysing traveller data. Which makes them perfect resources for constructing traveller profiles. Despite being a staple in every travel manager's arsenal, the GDS is also one of the most irksome tools available. And, all things considered, augmenting your GDS might be the most effective way of simplifying complex travel arrangements. This is actually one of the main charges levied upon GDSs, that they don't handle complex itineraries as well as they could – especially interline and code-share bookings. Which isn't to say they do it poorly (in fact, they're the best tool for the job right now), it's just that other industries have much more capable tools that provide a similar function. Another justifiable complaint is that the GDS user experience lacks the polish of its commercial counterparts. Ultimately, your out-of-the-box GDS is designed with travel providers in mind, rather than end-users and this is reflected in the UX. Often itineraries are incomplete, span multiple documents, are littered with third-party advertising, or are presented in a hard to read format. We've already mentioned how the business travel experience can be greatly improved with easy-to-read itineraries and this is a great chance to elevate your service above competitors. Integrating your GDS with a travel itinerary template plug-in is a simple solution and can consolidate everything from flight and ground travel information to check-in and destination guides – completely ad-free. At a time when business travellers are demanding wider selections of products to choose from, it sometimes feels like it's impossible to avoid passing on the complications inherent with more complex itineraries. New technologies, like bespoke business travel apps and AI-chatbots, are sure to be in high demand over the coming years, but TMCs certainly shouldn't underestimate the effect of augmenting the performance of everyday tools – like your trusty GDS. Integrating readily available plug-ins can add a range of functionality to your GDS that makes it easier to deliver an uncomplicated and uncluttered business travel experience. To learn more about increasing the effectiveness of this often used, but rarely mastered business travel tool, download our new ebook How to Get the Most From Your GDS. 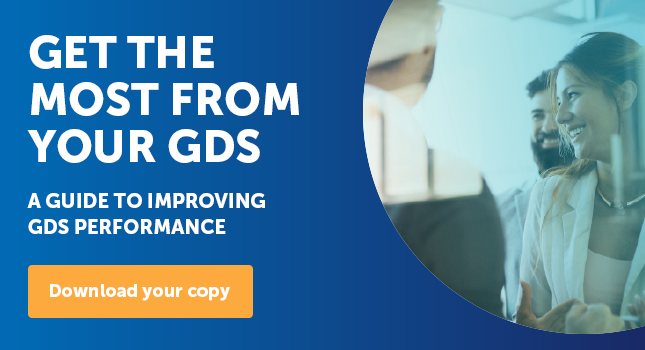 New Download: How to Get the Most from Your GDS What are the Challenges Faced by the GDSs?